The fascinating and widely celebrated work of the contemporary American photographer Gregory Crewdson comprises another interlude in the long, long love affair between the cinema and the world of photography-as-high-art. There are precedents for this kindred-spiritedness; it has encompassed everything from onetime photographer Stanley Kubrick's symbiosis with his mentor, photographer-artist Diane Arbus (herself the natural subject for a movie), to the foray of the film-inspired Cindy Sherman, the most prominent American photographer of the late 20th Century, into narrative features with 1997's Office Killer; even Pink Flamingos director/sometime gallery-shown shutterbug John Waters made a movie about an accidental high-art photographer. But Crewdson, as revealed in director Ben Shapiro's documentary Gregory Crewdson: Brief Encounters, is, in more ways than one, a rarer case. Rather than using the relatively insular, museum and gallery-bound world of photography as a launching pad to the big time of the movies (and thereby diffusing the mysterious, highly concentrated power available to a single, still image over a 90 to 120-minute length, which, as Office Killer proved, can have interesting but decidedly mixed results), he pulls in and crystallizes the layered impact of whole movies into the mesmerizing, jaw-droppingly rich and transfixing single moments of time frozen forever within the still frame of a photograph. The subject of Shapiro's film is actually twofold: To begin with, there's the partly-biographical "why" of the cinema-obsessed Crewdson's adherence to photography as his medium of choice, but more importantly, it probes deeply into the how -- by what alchemical, mind-bogglingly intricate and complex process could he possibly be creating the simultaneously eerie, tender, uncannily powerful and moving, endlessly detailed moments we experience in his photographs? At its liveliest and best, Brief Encounters is nothing short of an all-access pass behind the scenes for a 10-year period of Crewdson's life and career (approximately 2000 through 2010) during which he created a vast project entitled Beneath the Roses, a series of around 50 neo-American-Gothic, truly cinematic photos that remain his most monumental, indelible work to date. There is a connection between the life and the work Shapiro and Crewdson both find important, though. Unlike recent documentaries about artists that focus much more exclusively on the work of the artist-subject and tend to avoid the biographical -- Gerhard Richter Painting, Over Your Cities Grass Will Grow -- Shapiro feels freer to indulge us in a narrative about Crewdson's (happy) childhood and where he grew up (Park Slope, Brooklyn, just like in The Squid and the Whale), his personal path to the specific artistry he practices (which, before he found a new home in the post-manufacturing, economically depressed small-town Western Massachusetts landscape in which Beneath the Roses saw him struggling with dyslexia, dropping out of college, and playing in a late-'70s NYC punk/New Wave band whose one hit, which he co-wrote and the video for which Shapiro includes clips, was called "Let Me Take Your Photo"). But in this case, such life story-delving dovetails as much with what the artist is about as the emphases and style of those other documentaries did with their more reclusive, psychology- and personal-biography-shunning subjects. Crewdson's father, we learn, was a psychologist who practiced out of an office in the basement of his by all appearances happy and well-adjusted family's Brooklyn brownstone, and Crewdson informs Shapiro and us, during one of several sit-down interview sessions from over the years that are incorporated into the film, that this fact relates to his work in that a) he's a firm believer in the psychological -- that there's a psychological component to what he does, some expression of some part of himself not expressible through conscious thought or words -- and b) that as a child, there was something mysterious, fascinating, and possibly quite dark hidden right within the texture of his normal home life -- a sense of the alluring, foreboding secrets of life, as "real" and powerful (if not moreso) as what we let rise to the surface, just out of sight. Crewdson convincingly posits that this formed some major part of his sensibility, the unique mood of his heightened-realist photographs, which, as we can see from the ample specimens Shapiro lets us in on, both during the hectic throes of their creation and in their perfect completed form, are at once tender, intimate, and coolly ominous -- nigglingly uncanny renderings of recognizable places, people, and situations, like some vivid and disconcerting dream. But for all Crewdson's appealing personality (he's an affable and sweet-natured, bohemian-slacker-appearing middle-aged guy whose rotund, cherubic, youthful presence is not unlike that of Before Midnight filmmaker Richard Linklater) and articulateness about why he believes he does what he does, providing us descriptive illuminations of the connections between his life story, his personality, and the art he makes (with friends/commentators like novelists Rick Moody (The Ice Storm) and Russell Banks (The Sweet Hereafter), and Aperture magazine editor Melissa Harris, also appearing to offer their own musings upon and appreciations of Crewdson and his work), it is still only a foretaste of what's truly rewarding in the film: Shapiro and his camera's privileged access to Crewdson at work on a handful of the productions he mounted for Beneath the Roses. "Production" is the right word, and hints at the set/location-like sites and organization of creation that will make Shapiro's up-close look at Crewdson's process, both conceptually and logistically, especially interesting to any cinephiles who happen to be watching. Although the end result of the vast preparations we see being made will be only a single frame (in the case of Beneath the Roses, usually depicting down-and-out human figures at moments of eerie, sometimes frightening or abject grace against the backdrop of that landscape of a forgotten America of mid-sized average towns, once so beautiful and vibrant and now in the more terminal stages of crumbling decay), the composure and the mis-en-scene of what Crewdson envisions is so ambitiously detailed and precise that it requires much of the same preparation necessary for a film shoot: The development of an idea (often germinated from a specific cinematic or artistic inspiration -- Diane Arbus, Edward Hopper, David Lynch, Alfred Hitchcock -- then evolved into a specific image/scenario of his own by Crewdson); location scouting, casting, storyboarding; a "shoot" that marshals actor-models, permits, multiple assistants, production designers, a director of photography, and nail-biting concerns about daylight and weather; and a minute and extensive postproduction process. This is the suspenseful, thrilling ride Shapiro takes us on with Crewdson; there's an inbuilt, exhilarating and terrifying dramatic tension to watching the photographer go through so much effort to make so many painstaking (not to mention expensive) preparations when so very many things can (and do) go wrong as that moment of truth approaches, that instant when the camera's shutter will snap open for a magical second, hopefully capturing a "scene" that is as close as possible to what Crewdson saw in his mind's eye. 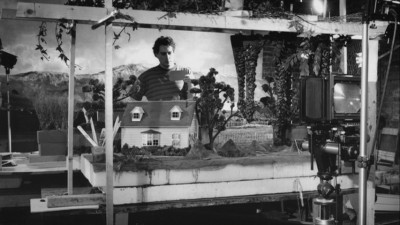 Shapiro's structure and style are deeply sensitive to both Crewdson's life and the way the process of his work fits into it; Shapiro is his own cameraman here (as he was for a couple of public-TV segments he did on Crewdson before the two agreed to the much longer-term project that became Brief Encounters), and he, along with editors Tom Patterson and Nancy Kennedy, have an excellent intuition for what to shoot and how to shape it to match the rhythms of Crewdson's existence, whether in relaxed, meditative, and verbalizing mode when Shapiro films him ruminating or preparing, or in nervous, exuberant, hyperkinetic action as he "directs" his pictures. 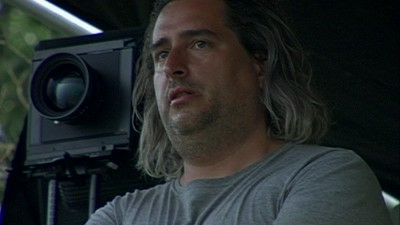 There's a loose, relaxed quality to the interviews and a rough-and-tumble chaos to the behind-the-scenes footage of Crewdson on the "sets"/precisely-prepared locations of his photos, but each time the striven-for second arrives and the camera is clicked, Shapiro cuts to black on that thrilling, finality-laden sound for a moment, and then brings us back up onto a shot of the photograph in its final, finished form (the film's usually fitting and unobtrusive score, by Dana Kaproff, actually works best at these moments; its slow, sparse, sweetly melancholy piano melodies "soundtrack" both the photograph and the achieved but sad sense of artistic completion/conclusion). The gratification of this is partly owing to the exciting skill, hard work, and imagination Crewdson has put toward making beautiful, unusual photos that pin down, just for the split second on view within the frame, something strongly mysterious, ambiguous, and ineffable (for better or worse) about the tenuous relationships between life and dreams, debasement and dignity; Shapiro has, basically, chosen a great, entertaining and enlightening subject and then smartly let that dictate his style, form, and structure. But our engagement with everything about this photographer's life, process, and impressive body of completed work is deepened immensely not only by Shapiro's skill as interviewer and cameraman, but more deeply and invisibly by the documentarian wisdom of his selectiveness from what he's documented, his shaping of the experience to best let us in without ever once bursting the grand illusion, the mystery of Crewdson's work. Whether you're already familiar with Gregory Crewdson's haunting photographs or whether Brief Encounters is (as it was for me) your introduction to it, the film opens your eyes into a unique and powerful artistic vision and way of working for a documentary journey of notable depth and breadth, as enthralling as it is informative. 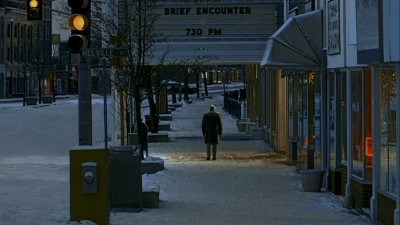 This transfer of Gregory Crewdson: Brief Encounters presents the film at an anamorphic-widescreen aspect ratio of 1.78:1 and bears full fidelity to the slightly varying gradations in high-definition digital-video quality (having been shot over years during which that technology was changing rapidly). The segments in which Shapiro's camera officially presents Crewdson's finished photos are of a markedly more composed and overall higher quality than the primary behind-the-scenes footage (an aesthetic choice that works well), but in general, colors and darks are nice and solid, and everything as vibrant as would be expected for a DV-shot documentary, with very little in the way of compression artifacts or other transfer issues aside from some scattered and slight edge enhancement/haloing. The Dolby Digital 2.0 stereo soundtrack is flawless; all dialogue sounds boldly, resonantly present and immediate through your speakers, and the richness of Dana Kaproff's piano score comes through with full sonorousness. No imbalance, distortion, or other audio flaws are present at any point. --Two deleted scenes (about 11 min. ), each detailing the shoot of another of Crewdson's photographs; well worth a look if you enjoyed the feature, as it's more of what makes Brief Encounters most interesting. --Additional interview footage with Banks, Moody, Crewdson, and others; more or less extended versions of the talking-head sit-downs excerpted and honed through editing in the feature. --A post-screening Q&A/conversation with Crewdson, Shapiro, and novelist/essayist Jonathan Lethem facilitated by film critic Elvis Mitchell, in which the four very distinct personalities talk about the film and Crewdson's work. --An insert featuring an interview with Crewdson and director Ben Shapiro from BlackBook magazine and a director's statement written by Shapiro. --The film's original theatrical trailer. One look at any of the almost unbearably evocative works of photographer Gregory Crewdson pulls one helplessly into a deeper and deeper immersion (you could get lost in a single stunning, minutely manicured/directed, detail-packed frame for hours if not days), and not least among the questions that arise all at once in that tidal wave of bowled-over wonderment is, how in the world did this artist manage to render on photo stock his supremely detailed, incredibly precise, indelibly haunting visions, all of which are luminous with the power of one captured, implicitly decisive moment of eerily significant Real Life, but none of which are anything that could ever be remotely accomplished by a point-and-shoot documentary approach (somewhat paradoxically, since what we're watching is a documentary)? This is the perfect question for a project like Ben Shapiro's Gregory Crewdson: Brief Encounters to address, because if nothing could (or should) ever reduce Crewdson's work by explaining or interpreting it and thereby taking that pleasure away from us, what a film like Shapiro's can reasonably do is show us where the artist came from; what inspires him; and how, logistically speaking, he creates. That is just what this film does, excellently and very satisfyingly so: It takes us into Crewdson's work in a thorough way, from the ground up -- working backwards from the direction of the artist's biographical history; then through his long, arduous, and complicated process of conceiving and preparing a shoot; up to the frantic, anxious day of the shoot itself; and finally to what can only be described as the exquisite climax of a photo taken, completed, and finished. Shapiro doesn't just expect us to take the well-established importance of Crewdson's work for granted; he lets us feel the momentousness of it as we're introduced to the very unprepossessing figure of Crewdson himself and then almost incidentally exposed to glimpses of the genius at work as we're taken through all the fraught, exhilarating steps of build-up and ultimate release innate in his labor-intensive process of artistic creation. It's enough dramatic tension and narrative structure for four or five movies, actually; the artistic journey, at least the way Shapiro has been able to document and convey it to us, is as suspenseful, engaging, exciting, and moving as the most scripted drama or action film. Gregory Crewdson: Brief Encounters is thus not only a very usefully informative introduction to a celebrated contemporary artist and the multidimensional aspects of how his beguiling, transfixing work is made; it's also a breathtaking thrill ride and an adventure. Highly Recommended.